I returned earlier this week from a two-week vacation at Maranatha Bible and Missionary Conference. It is a much anticipated vacation for my family because it is loads of fun. There are a host of activities for our boys, ranging from putt-putt to tennis to rock climbing to zip lining, and yet ample time to relax for hours each day at the beach pictured above. Yet it is not just about fun and relaxation, it is also a time of spiritual renewal. Each day there are two Bible-based teaching sessions. These sessions are led either by the pastor or the missionary organization that are featured that week. For example, our first week we heard from Erwin Lutzer (Moody Church, Chicago) and ABWE (specifically their project to build a hospital in Northern Togo). The second week we heard from Ray Pritchard (Keep Believing Ministries) and Wycliffe Bible Translators. It is humbling to hear all their stories and to witness the sacrifice that these people have made to serve God. Faith for the future is based on God’s grace in the past. (Erwin Lutzer) This means we need to be reflective and intentional enough to acknowledge and remember God’s gracious provision. Faith never judges God by circumstances. (Erwin Lutzer). In my opinion, there’s a growing problem among Christians that overemphasizes circumstances, which is contrary to the message of the Bible. Faith should never be determined by circumstances, nor should ethics. So this week may we persevere in faith, trusting God’s promises without demanding explanations. In short, may we exude the childlike faith that so pleases our Lord and Savior Jesus Christ! When I was about five or six years old, I prayed with my mom to accept Jesus as my Savior. Oh the sweet relief I felt to know that I would go to heaven when I died. My faith was simple and pure, and I am thankful that God heard my prayer. Yet I did precious little to grow my faith, praying now and then, reading a devotional here and there, and on rare occasions cracking open His Word. Far from being a devoted follower of Christ, I marched through the next couple decades, with eternal security in hand, living life my own way. It wasn’t until I got married that I begin to realize how unanchored my life really was. My husband exceeded my wildest expectations in every way and I was crazy about him yet somehow marriage wasn’t easy. It may have seemed like a fairy-tale from the outside, but on the inside there was a palpable absence of pixie dust. He was human and flawed. And I was human and very flawed. Boy, could I tell you some stories! But in retrospect our imperfections were a blessing. They made reality clear. My love for Will was imperfect, as was his love for me. Yet I had a longing, even a need for perfection. I desperately wanted someone who would never disappoint me, who would love me into being a better person, a forgiving person, and a more loving person. As I began to truly study the Bible for the very first time, I realized that I had been loved like this all along. Jesus had patiently and faithfully pursued me even when I accepted his saving grace and rejected his guiding hand. I was baptized when I was eighteen years old. I confessed Jesus as my Savior to the world, but I’ve often considered over the past five or so years whether I should be re-baptized. Because as Romans 10:9 states: “That if you confess with your mouth that ‘Jesus is Lord,’ and believe in your heart that God raised him from the dead, you will be saved.” I couldn’t say Jesus was my Lord in 1990, but by God’s grace, twenty years later, I can. 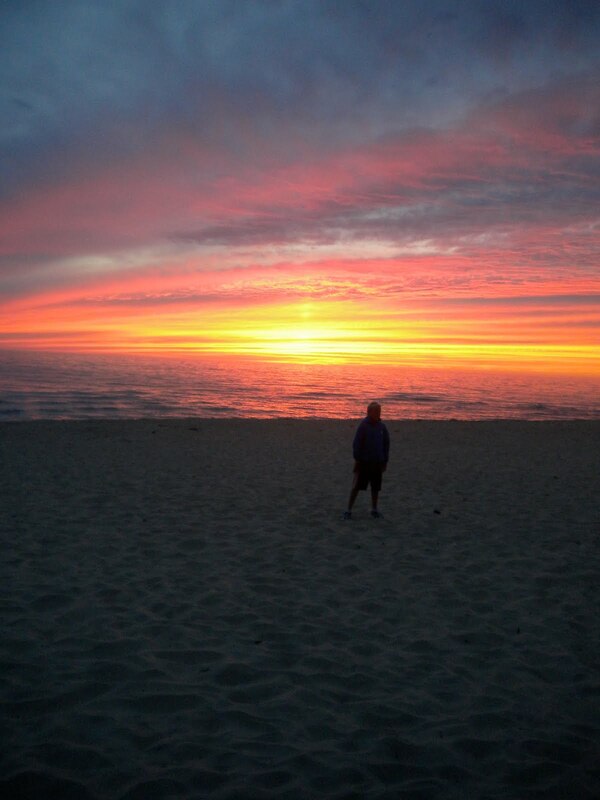 And that’s why on August 12, 2010 I was re-baptized at sunset in beautiful Lake Michigan. It was a wonderful celebration with many fellow believers standing on the sand, many of whom I am related to in one way or another. 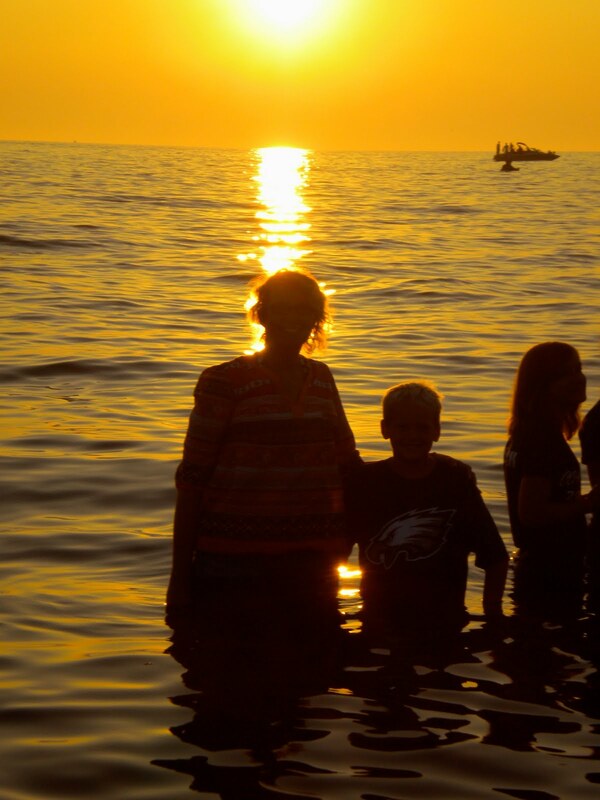 It was also incredibly meaningful because of who was standing next to me in the lake: my eight-year-old-son, Will. I am praying that his young baptism will mark his life in a profound way. I know he trusts Jesus as his Savior, and I believe he is serious about making Jesus Lord over all. Of course, the Christian life is a process and not just a one-time event. There is so much I want to share about our time at Maranatha, but I thought it was appropriate to start with this. I do want the world to know that Jesus is not merely my Savior — He is my Lord. I hope and pray that YOU can say the same! Until last July we lived in a condo that was quite unfriendly for visitors. Not only was it small, there was nowhere for anyone to park. So when we moved into our new house I was determined to entertain and faithfully use the ample space that God has provided for us. I have hosted many parties and guests in the last year, and have loved every second of it. In just the last two and a half weeks we’ve had a number of guests. To be exact, I’ve had fifteen different people who only stayed for a meal, and sixteen different overnight guests. They hailed from Hong Kong and five different states. What a privilege to have glimpses of all of these stories — thirty-one different flavors of people. I heard embarrassing stories, hilarious stories and profoundly sad stories. I heard about suffering, about discrimination, about misconceptions, about perseverance, victory and bravery. I witnessed a baby boy, once abandoned, now lavishly loved by a family who traveled around the world to get him. In fact, four of the children who visited my home were adopted — all of them little miracles, testimonies to love, the most powerful force in the universe. This week may we strive to look at the heart too. May we remember that each and every person was made in the image of God, deserving honor and respect. May we look past outward appearances, possessions and titles, and take time to listen the stories that God is writing in each life.